Whoever presents a great example is great. Lithuania is situated on the eastern shore of the Baltic Sea. 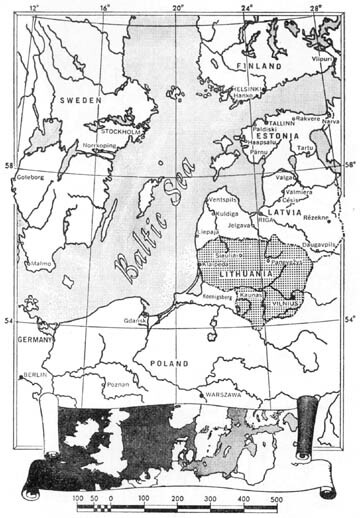 To the north lies Latvia; to the east, Byelorussia; to the south, Poland; and to the west, the so-called Kaliningradskaja Oblast (prewar East Prussia) and the Baltic Sea. With her 25,213 square miles, Lithuania is somewhat larger than Switzerland, Belgium or Denmark. According to the Soviet census of January 15, 1959, she now has a population of 2,711,000. In 1939, however, the population in this same area was 3,215,000, and under normal conditions, should have increased to 3,900,000 by 1959. These huge population losses are the result of Soviet and Nazi genocide. 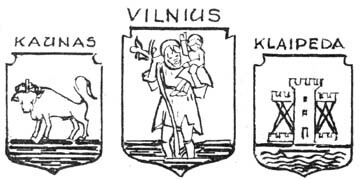 The principal cities of Lithuania are Vilnius (235,000), Kaunas (214,000), Klaipėda (89,000), and Shiauliai (60,000). 1251: Establishment of the Lithuanian Kingdom. 1410 United Lithuanian-Polish armies defeat the Teutonic Order at Tannenberg. 1795-1915: Lithuania under Russian rule. 1915-1918: Lithuania under German military occupation. 1918: Restoration of Lithuania's Independence (February 16). 1939: Secret Soviet-Nazi agreements concerning Lithuania (August 23, September 28). 1940: Soviet invasion of Lithuania (June 15). 1940: Mass arrests of Lithuanians by the NKVD (July 11). 1940: USA reaction against Soviet aggression (July 23). 1940: Beginning of organized Lithuanian resistance (in October). 1941: First mass deportations (June 13-20). 1941: Armed revolt against Soviet occupation (June 23). 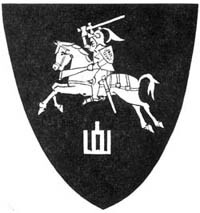 I944: Re-occupation of Lithuania by Soviet armies. 1944: Beginning of guerilla warfare against the Soviets. 1953: Investigation of Soviet aggression against the Baltic States by the Select House Committee (July 27).